Summary (from the back of the book): Cracker is one of the United States Army's most valuable weapons: a German shepherd trained to sniff out bombs, traps, and the enemy. the fate of entire platoons rests on her keen sense of smell. She's a Big Deal, and she likes it that way. Sometimes Cracker remembers when she was younger, and her previous owner would feed her hot dogs and let her sleep in his bed. That was nice, too. Rick Hanski is headed to Vietnam. There, he's going to whip the world and prove to his family and his sergeant--and everyone else how didn't think he was cut out for war--wrong. But sometimes Rick can't help but wonder that maybe everyone is is right. Maybe he should have just stayed at home and worked in his dad's hardware store. 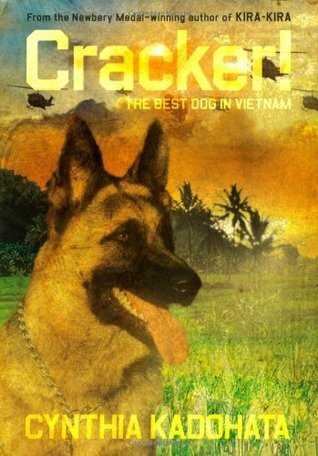 Review: A book about the experiences of a young man in the Vietnam Conflict combined with a story about his dog? Sign me up. I have meant to read this book for about six years and can't believe it took me so long to get around to it. I've spent the day reading with tears streaming down my face. Any book that is told partly from the dog's perspective is going to be a good one in my view. I like how the story was told from both Rick's point of view and Cracker's often changing perspective mid-page. It wasn't confusing, but rather obvious given the thoughts that were happening. I also loved the relationship between Cracker and her original owner, twelve-year-old Willie and between Cracker and Rick. As any dog owner knows, there is a special bond between dog and owner. I like to think my dog, Charlie, communicates with me, but I realize now that soldiers and their dogs really have to be in tune with one another and have very special commands in order to do their jobs. While this book takes place in Vietnam, I did keep thinking about the soldiers who are dog handlers in both Afghanistan and Iraq. The main difference is that in Vietnam, US soldier-dogs were not brought home. I cannot imagine working so closely with a dog then having to leave him to be put to sleep or released into the local population. Thank goodness that practice has changed. If you want a feel-good book then this is one to read!